This post is about the Massively Online Open Course on Connectivism and Connective knowledge (CCK08) facilitated by Stephen Downes and George Siemens. 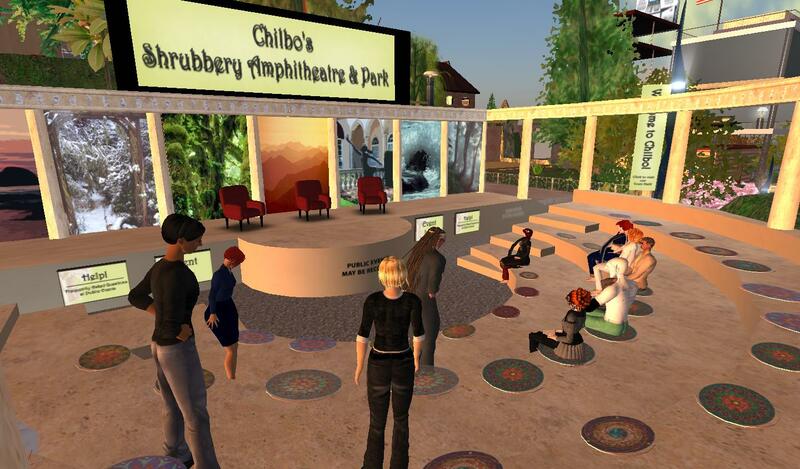 SL resident Fleep Tuque has organized an in-world cohort that holds weekly meetings. On Tuesday September 16th I attended for the first time, and it turned out to be quite a learning experience. What is Connectivism, is Connectivism a theory, is the question “what is ..” the right one to ask about Connectivism, the concept theory itself is ambiguous, is Connectivism a sort of pragmatism, technology and context as keys for learning, is it plausible to compare the learning process with neural networks, technology helps dealing with information overload as well as it creates overload, internal memory vs. external memory, are we becoming more reliant on external memory as information overload increases. And then the discussion ended by a debate on the participants’ familiarity with C-map, Mindmeister and Diigo. 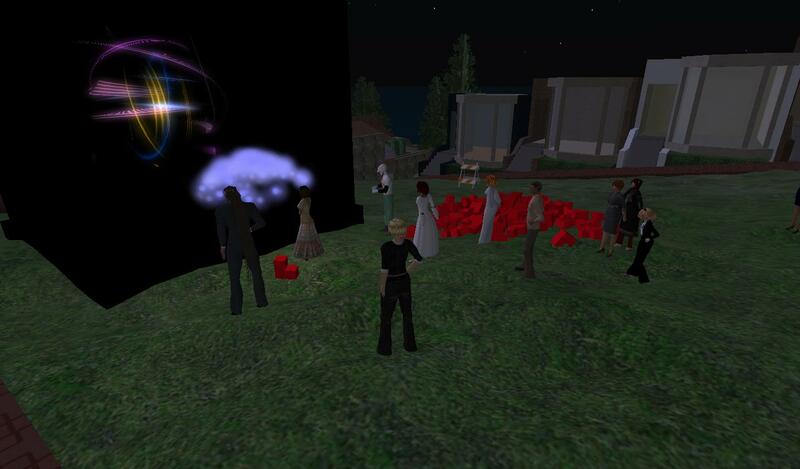 After this half hour of discussion we teleported to The Connectivism Village to have a look at the different facilities Fleep and Graham Mills have designed for the course in-world. 2) I’m not a fan of text chatting, and I don’t think I ever will be – at least not when discussing complex matters. I’ve been confirmed in my presumption that text chat is best suited for decision making and quick clarification, not as a tool for serious, lengthy debates. However, I don’t want to dismiss text chat as a tool for serious debating just yet. I think it may work if the topic was well defined and narrow. You may think that I’m more of an asynchronous learner, but I don’t think that’s the case. RL I just love intense discussions, and I can easily handle complex diversity and people interrupting each other. Online it s a different story though. When engaged in synchronous online discussions with many participants I do prefer a more structured organization than usual. RL we’re used to looking at non-verbal signs to decode wither someone is finished, about to say something etc. When non-verbal signs are not possible, I think we may have to compensate in other ways e.g. by structuring the turn-taking. 3) One of the current problems of the cohort is that not all of us (me included!) have read the suggested literature, so we do not yet have “common ground”, which I think can be quite essential for fruitful discussions. As I see it, many of us are still trying to ground ourselves in the many, many different course materials both in- and out-world. Learning how to manage this complexity becomes pertinent, and since there are clear references to chaos theory, it’s only natural (?) that this learning process is quite confusing and at least initially somewhat unpleasant. 5) One of the reasons why I signed up for this course was that I wanted to return to the role of the learner. I actually don’t think I really ever leave this role, but this is a more formal role. Other people (Siemens, Downes, cohort participants) have great influence on my current learning, and being an online facilitator myself, I think it’s important to return to this role occasionally. As it turns out I, together with my colleague Jørgen Lerche Nielsen, am facilitating an online course with 23 new MIL students parallel with the CCK08. I follow the students discussions and watch them trying to find common ground and become familiar with a way of learning and debating which to most of them is completely new. Participating in the CKK08 reminds me how difficult, confusing, frustrating, exiting, and fun it can be to enter a new community of practice. Lave & Wenger’s (1991) and Wenger ‘s (1999) theories on situated learning and communities of practice in fact are some of the theories that my students have chosen to discuss, and I don’t think it’s all coincidental. The concept of being a legitimate peripheral participant seems very appropriate for all of us. Jean Lave and Etienne Wenger (1991) Situated Learning. Legitimate peripheral participation, Cambridge: University of Cambridge Press. Etienne Wenger (1999) Communities of Practice. Learning, meaning and identity, Cambridge: Cambridge University Press. George Siemens (2004/2005) Connectivism. A Learning Theory for the Digital Age. For me this assumes that this course is a community. It doesn’t feel like a community to me, although there may be smaller communities forming within the whole course. The whole course feels very much like a network to me, which of course is what it’s supposed to be. I think in a community, people are more accountable to each other. A community is also more bounded – whereas a network is more fluid. Do you think there are differences between networks and communities? And if so, how would you describe the differences? I enjoyed reading your blog. I haven’t been into the second life space yet so it was interesting to view the screen images you posted here. I agree, I find online chat is quite difficult to follow because usually there are lots of people typing at the same time and lots of different conversations going on. I imagine it must be worse when English is not your native tongue, I speak conversational French but have trouble (even in RL) when a number of people are talking at the same time. I think it is better if you can use audio as well…but even then, I don’t think you can have a really in depth conversation unless it is well structured. But I am relatively new to online learning and still learning…so I will keep an open mind about that comment. One thing I like about this course is that you don’t have to be an expert to be an active participant. Re: your concept of “centre of a community” because there are so many communities in this course I think it is easier to move towards the centre. If there was only 1 “hub” (I actually did the reading this week, I still haven’t done last weeks though) I think it would be very difficult to move towards the centre – especially with over 2000 people in the course. Yes, I do believe there’s a difference between networks and communities. If we look at the nodes and ties they can be more or less strong, and at least in my understanding the community concept implies nodes and ties stronger than in networks. Also there are according to Wenger 3 specific premises for a community of practice (the CoP); there has to be a joint enterprise, mutual engagement and a shared repertoire. Especially the latter is why I find our SL cohort to be a community rather than a network. Even though we didn’t necessarily know each other before the course (some do though) most of us already knew some of the routines, the lingo and many other cultural artifacts related to this particular context, which of course will evolve and could change over times based on mutual negotiation. When looking at the whole CCK08 course, participants first need to establish the context(s). This I think we already had from the beginning in the SL cohort. Furthermore I don’t think the need for mutual engagement and negotiation are necessary premises for a network to work well. It’s is an interesting discussion though, and I would like to explore the similarities/differences between networked learning, situated learning and connectivism further ..
Well, first of all I highly recommend that you have a closer look at SL sometime – it’s quite a unique community and very relevant for teaching and learning experimentation. Both asynchronous and synchronous communication has strengths and weaknesses and which tool to chose seems to be a recurring question in e-learning. I think that my main point is that we often have to compensate for the lack of non-verbal communication by deliberate pedagogical design according to goals, target group, possible processes and how we wish to evaluate/assess the outcomes. I enjoyed very much reading your post. It helped me in several ways. Second. Now I see that I am at the periphery too though I do not have yet enough knowledge on connectivism to engage in deep conversation. I loved your concept of “being a legitimate peripheral participant”, it helped me to put things into perspective and to have a second target: find the center and move towards it. Third. I was lost in SL (in fact I am lost in many places) and did not find the cohort group. I found the Connectivitas group. Your link to the place was a blessing, could you tell me please at what time do they meet on Tuesdays? Which is the name of your avatar? I would like to have you as friend in S.L. If it is not too much to ask, could you also give me please the link to the wiki? Fourth. I am relatively new to online teaching theory and to formal subjects like the ones handled in the course. To see how you place quotes within a post and after the post was a valuable lesson. I am also a non native English Speaker but I have found a way to understand within a numerous group, it took patience and practice. I agree with Jenni and you, the text chat is not easy to follow. Thanks for all the gifts that your post brought to my life. I am glad you found inspiration in my post. I’ll get back to your questions later today, but I’m currently attending a f2f course (on Classroom research and didactics by the way!). Yes of course feel free to friend me in SL, where I’m Mariis Mills .. RL I respond to Marianne ..
My thoughts on the distinction between network and community were based on my existing knowledge on Wenger’s CoP-concept. I do however think the distinction is somewhat blurred and I’ll return to this after a closer look on the course materials.